The two main traditional solutions for preventing suicide in the last century have been the clinical treatment of suicidal people (i.e., psychotherapy, medication, and hospitalization) and the establishment of suicide prevention centres and community programmes (e.g., schools). However, a third approach to suicide prevention, which is one of the oldest methods of prevention, is known as controlling the environment. Removing the sword from the defeated soldier in battle, for example, is an ancient act of prevention. Yet, this prevention tactic has been infrequently discussed until recently. Presumably because most of the work with regard to the prevention and intervention of suicidal behaviour has remained within the realm of clinical settings, this neglect may be understandable, although given current research, too limiting. Erwin Stengel (1964) was one of the first in this century to propose controlling the environment as a means for decreasing the incidence of suicide, noting, for example, that the detoxification of domestic gas (from coal gas with high carbon monoxide content to natural gas) might have reduced the suicide rate in nations where the switch had taken place. Subsequent research on the detoxification of domestic gas in England supported Stengel's proposal (Kreitman, 1976). More recently, a review of the research by Clarke and Lester (1989) and an international examination by Leenaars and experts (2000b) from 12 nations validated the approach in treatment. This perspective on prevention is consistent with a report on suicide prevention of the World Health Organization (WHO). After careful analysis of all measures by an international team of researchers, headed by Bertolote (1993), a series of tactics to prevent suicide that had support in the scientific literature were proposed. The team provided six basic steps for the prevention of suicide. All but one, the treatment of psychiatric patients, are consistent with controlling the environment: gun possession control, detoxification of domestic gas, detoxification of car emission, control of toxic substance availability, and toning down reports in the press. They also offered further measures under the rubric of "other measures". These too are consistent with environmental approaches, such as fencing high buildings and bridges. Although there is no definitive evidence for the effectiveness of the "other measures", the research strongly supports the five measures that call for controlling the environment as effective means of reducing suicide. Gun control is often cited as the prototypical example of controlling the environment to prevent suicide. Although countries differ in the most frequent method for suicide, firearms are a preferred method in many countries. An opportunity for studying the effects of legislative means restriction, e.g., gun control laws, on their use for suicide is provided by Canada's Criminal Law Amendment Act of 1977 (Bill C-51), enforced since 1978. This Act requires acquisition certification for all firearms, restricts the availability of some types of firearms to certain types of individuals, establishes procedures for handling and storing firearms, requires permits for those selling firearms, and increases the sentences for firearm offences. Early commentators on the impact of this Act found little impact of the Act on firearm suicide in Canada, but presented only simple charts, with no statistical analysis of the trends. Lester and Leenaars (1993) remedied this omission and reported a comprehensive study on the preventive effect on suicide of the Act in Canada. 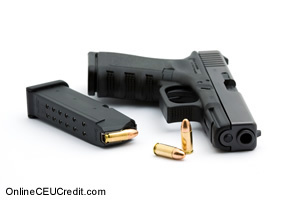 Their study suggested that strict firearm control laws might have reduced the use of firearms for suicide. Further, individuals did not switch to other methods. Subsequently, Leenaars and Lester (1998) showed that the gun control law was most effective with females and younger people (and, vice versa, least with people over 65). Furthermore, Leenaars et al. (2003) reported that even if one controls for social and economic variables, the impact of gun control is still evident. Environmental control works. Results on related phenomena on homicide and accidental deaths hold equal promise. The tactic of controlling the environment is, however, more complex than gun control, although it is a prototypical example. Referring to gun control as a means for suicide prevention in Canada and in the USA probably makes sense because it is the main method of suicide in those countries. However, in other countries, guns are not a frequent means. Cantor and Baume (1998), for example, noted that in Australia there has been a modest decline in firearm suicide, but a major rise in hanging. Obviously, availability is only one factor; Cantor and Baume suggest that "acceptability" may be equally relevant to understanding the impact of the environment on suicide. Acceptability is consistent with the environmental view. Bowles (1995), for example, showed that drinking poisonous herbicides was, at one point in time, the most available and acceptable means of suicide in Western Samoa. Firearms may not be available in some countries. For example, in Cuba, firearms are not readily available and are the least frequent means for committing suicide in this nation. This is also true in Japan. As reported by Takahashi et al. (1998), the firearm control law in Japan is one of the strictest in the world. Only about O.2% of suicides yearly are committed by guns; yet, the use of other acceptable means is frequent. For example, in the 1980s, Paraquat, a highly lethal herbicide, was often reported in the media as a lethal means. A series of suicides by this method, thus, occurred. Paraquat was readily available in every garden store and, according to Takahashi et al., it became a very accepted means-much like in Western Samoa and other regions of the world. Only after environmental controls were implemented did the use decline. Paraquat only became available upon a detailed buyer check, much like the implementation of gun-checks in some countries. The commercial concentration was reduced. An offensive odour and emissions were added. A massive educational programme was undertaken, and so on. Takahashi et al. have concluded that these environmental control measures resulted in a decrease in the use of Paraquat ingestion. Thus, one can see great variation in means in various regions and, although gun control may make little sense in some regions, the tactic of controlling the environment may still have applicability, as suggested in the WHO report. There may be, however, a need for culture-specific control of the environment (Takahashi et al., 1998). Controlling the environment goes beyond issues of the method. The WHO noted, for example, that there was strong support in research for toning down reports in the press. The effect of the media has, in fact, been reported for centuries. For example, Goethe's (1774) novel, The Sorrows of Young Werther-the story of unrequited love, resulting in suicide (see Chapter 2)-had a reported contagion effect. Philips (1974) was one of the first in the last century to document the impact of the media on suicide rate. Several subsequent suicidological reports have indicated that there is an association between media reporting about suicides and suicidal behaviour in a society. A field experiment concerning mass media and suicide has been reported by Sonneck et al. (1994). In Vienna, after the implementation of the subway system in 1978, it became a common means of suicide. Mass media reported about these events in dramatic ways and subways became a readily available and acceptable means of suicide. Subsequently, efforts were made, under Gernot Sonneck and El-mar Etzersdorfer (see Etzersdorfer & Sonneck, 1998) to provide guidelines for media to report suicides. Reports in the media changed and the number of subway suicides and attempts dropped more than 80%, remaining at low levels since. Although available, it became less acceptable. Thus, once more, the principle of controlling the environment, in this case toning down media reporting, appears to have utility. Controlling the environment is, in fact, not foreign to practising psychiatrists. Control of the availability of medicines is a common practice, and is one of the five steps for prevention found to be effective in the prevention of suicide by the WHO. In 1972, Oliver and Hetzel (1972) first called attention to the adverse effects of the availability of medication. There are variations in mortality rates associated with overdoses of medicines (e.g., antidepressants, sedatives). Common practice calls for prescribing medications that are safe or in small amounts with high-risk patients. According to the WHO, this action is consistent with controlling the environment to prevent suicide. The WHO even suggested that the pharmaceutical industry could contribute by providing appropriate dosage units and packages. The approach of controlling the environment is much broader than control of toxic substance availability. Examining steps such as gun control and fencing bridges may broaden the understanding of the complex solutions needed to prevent suicide. Not only may this approach impact on direct service, but it may also be an occasion to reflect on the support of public health action. The detoxification of domestic gas, for example, was supported by the medical research of Kreitman (1976) in the 1970s, and has been estimated to have saved uncountable lives. Although further research is needed, means restriction and the more general approach of controlling the environment may be a viable strategy to prevent suicide in all regions of the world. Yet, despite the recommendations of the WHO and the research, there has been a lack of impact on clinical practice globally. The lack of education about means restriction is a clear illustration. The study by Wislar and his colleagues (1998), for example, exemplifies this absence.. They conducted a chart review of youth receiving mental health evaluation, with 40% being suicide related, in an emergency department of a hospital. Chart reviews provided no evidence that means restriction education was provided. Although further prospective research is needed on the topic, Wisler et al. 's study, and other studies with similar findings, call for greater attention to controlling the environment in the treatment of suicidal patients. The lack of means restriction education may be a failure in care and applies not only to guns but to other means (e.g., availability of medicines). Consultations on a difficult case where there is imminent risk, especially with lethal means, are not only helpful (e.g., have we adequately controlled environmental factors? ; has the gun been secured? ), but are sound practice. There are broad global implications of this research, I believe, in the care and failure in care of suicidal persons. To conclude, as noted elsewhere in this book, suicide and suicidal behaviours are multifaceted events. This complexity of causation indicates the necessity of a parallel complexity of solutions. Prevention of suicide or suicidal behaviours can be understood as being any action that contributes to a decrease in the frequency of the event. The approach known as controlling the environment has been shown to be the most effective. This third solution to prevention departs from the approaches of traditional treatment, such as psychotherapy, and suicide prevention centres or programmes; however, in light of research, this tactic cannot be ignored in clinical practice. - Leenaars, Antoon A., Psychotherapy with Suicidal People: John Wiley & Sons, Ltd.: West Sussex, 2004. The preceding section contained information about environmental control with suicidal clients. Write three case study examples regarding how you might use the content of this section in your practice. What were the six basic steps the world health organization proposed for the prevention of suicide? Record the letter of the correct answer the CEU Answer Booklet.